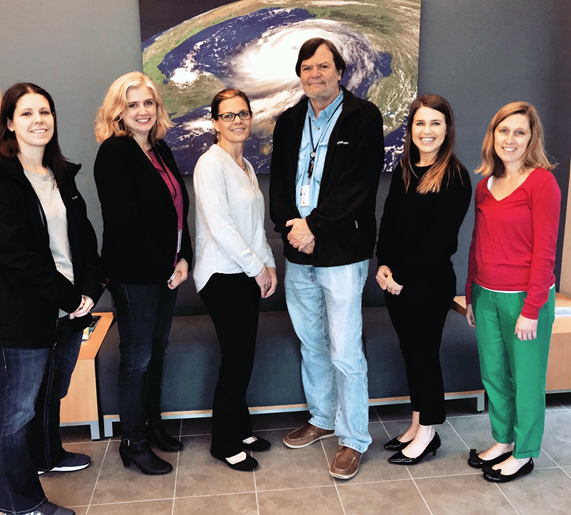 MARCH 15, 2019 — The OR&R Disaster Preparedness Program (DPP), established just over a year ago, is fully staffed and moving full steam ahead. Katie Krushinski, Kimberly Albins, Kate Wheelock, Charlie Henry, Alyson Finn, and Jessica White. Image credit: NOAA. Leading the team is DPP Chief, Kate Wheelock, Gulf of Mexico Disaster Response Center (DRC) Director, Charlie Henry, and DRC Deputy Director, Jessica White. Team members Katie Krushinski, Kimberly Albins, and Alyson Finn complete the team, allowing the DPP to take on new and expanding responsibilities. The team’s combined response insight and experiences have helped improve visibility and partnerships with other line offices. This year, the team will be taking on new projects, continuing to improve the preparedness and response culture throughout the National Ocean Service. For further information, contact Alyson.Finn@noaa.gov.